Gazelle or goat parchment with ink and gold watercolour; the binding embossed leather. A manuscript comprising the second half of the Holy Qur'an that was placed for recitation in the Dome of the Rock for a number of centuries. A number of pages were lost as a result of its long use. The binding comprises two covers: the back and the front, fastened with a bolt-like clasp. The format is landscape, common for Qur'ans belonging to the first three centuries of the Islamic era. The binding is embellished by an embossed border of four lines, the inner part of which is gilded and outlined with braided silk thread. In the centre of each of the covers is a medallion with a spiral circumference. Within each medallion are intertwining vegetal decorations composed of five-leaf flowers. The inside of the binding is sheathed with light-red leather. The cover is not original and not earlier than the 12th / 18th century. The first and last two pages contain three rectangular panels framed by straight and circular bands which intertwine with each other. The inside of the bands are ornamented with red and blue dots. The spaces that result from the intersection of the bands are adorned with geometric lines interspersed with a number of dots in green. The Qur'an was written in kufic script in black ink. Vowels are stipulated in red, diacritical points in black; the pauses between verses are indicated by three slanted lines. The lines are numbered to enumerate the number of verses in each chapter. The names of the chapters (suras) are written in gilded kufic script, within rectangles framed in red. The chapter headings are not written in any one style and some are more decorative than others. The placing of the headings is unpredictable; sometimes within the upper section of the page, sometimes at the bottom within the lower band, and sometimes in the middle band. Sometimes the headings are illuminated within the decorative bands which contain simple and extremely beautiful decorations and whose design, size and form differ from one band to the next. This section is divided into seven of seven parts. The spreads that begin each of the one-seventh sections are distinguishable; the one under discussion by the presence of two frames that surround the content of each page. Both frames are decorated with different coloured dots. The number of the seventh part, the chapter title that it falls under, together with the corresponding verses from the beginning of the section to which it relates, are written in the upper section of the frame. The manuscript is the second half of the Qur’an. Its format is landscape and it is bound between two decorated leather covers. It is written in kufic script in black ink on gazelle parchment. Decorative motifs are distributed throughout and especially at the beginning of chapters. 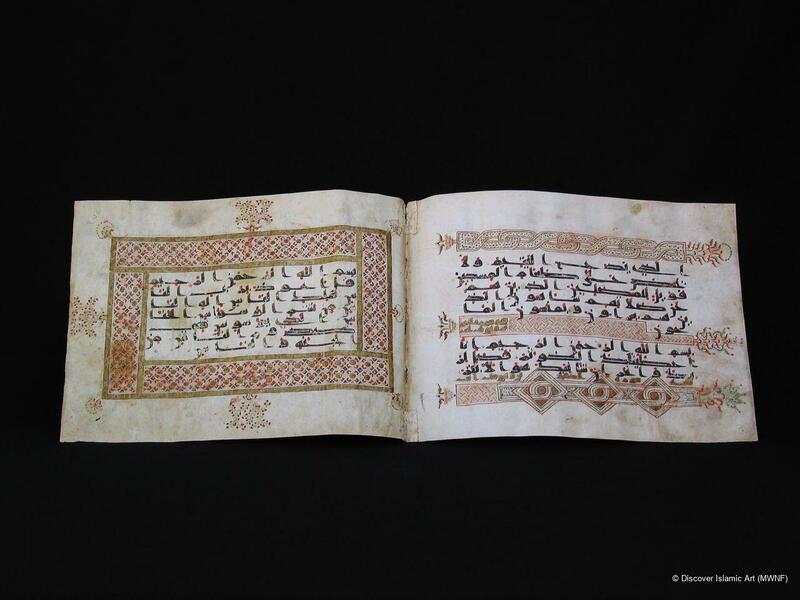 It is considered to be one of the earliest Qur’anic manuscripts extant. An inscription within the manuscript dates it to 984 / 1547), and indicates that the Qur'an was linked to Hasan bin al-Husayn. The style of kufic script also supports this date as does the style of decoration which was widespread in this period. The manuscript was transferred from the Dome of the Rock to the Islamic Museum. Iraq was narrowed down as the place of production in view of the fact that most of the family of the Prophet was in Iraq at that time. The kufic script, together with the style of decoration used in this manuscript, coincide with the use of the same style which predominated in Iraq at that time. Al-'Asli, K., Turath al-Filistin fi Kitabat Abd Allah Mukhlis [The Heritage of Palestine in the writings of Abd Allah Mukhlis], Amman, 1986. Deroche, F., The Abbasid Tradition, London, 1992. Al-Munjid, Salah al-Din, Dirasat fi Tarkikh al-Khat al-'Arabi [Studies in the History of Arabic Calligraphy], Beirut, 1971. Salameh, K., Al-Makhtutat al-Qur'aniya fi al-Mathaf al-Islami in al-Haram al-Sharif' al-Quds [Qur'anic Manuscripts in the Islamic Museum at al-Haram al-Sharif, Jerusalem], Paris, 2003. Khader Salameh has been the Director of the Islamic Museum and Al-Aqsa Library in Jerusalem for more than two decades. He was previously employed in the Hebrew University Library and worked as a librarian in Saudi Arabia and as a teacher in Libya. He is a Ph.D. Candidate in Ottoman History. He received a Certificate of Librarianship in 1986 from the Hebrew University. He obtained his BA degree from Beirut University in 1980. 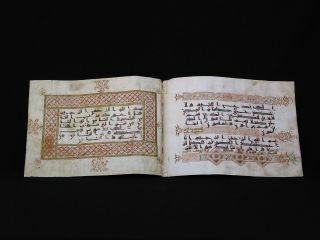 He catalogued the Manuscripts Collections of the Haram al-Sharif, which was published in six parts in several countries. His publications include many articles on different subjects and a recent publication in English and Arabic on the Qur'an manuscripts in the Islamic Museum.